Tax forms from the Canada Revenue Agency. TORONTO -- In the mad dash to file taxes before the April 30 deadline, Canadians often miss out on easy tax breaks, say experts. Knowing these lesser-known tax deductions and credits could save you hundreds or possibly thousands of dollars. 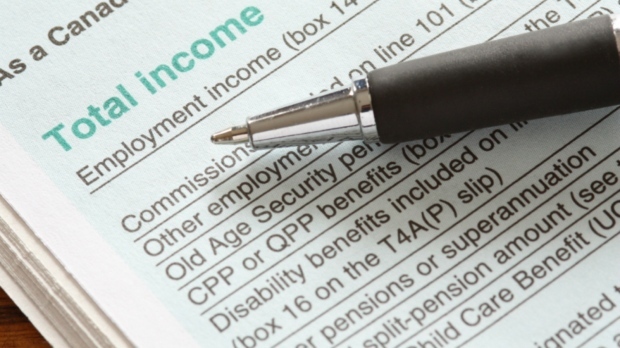 Of all the eligible medical expenses that can be claimed on tax returns, employee paid premiums for health and dental plans are typically neglected, says income tax professional Jason Heath of Objective Financial Partners in Toronto. "A lot of people figure, 'Ah well, I have a health plan and don't pay a lot out-of-pocket,"' he says. "But the thing that I see people forget quite often or don't know quite often is that if you pay the premiums for a health plan -- premiums that are coming off every paycheque -- those premiums count as medical expenses." Heath says that a tax credit can be claimed for 2016 if total medical expenses exceeded either $2,237, or three per cent of your income or that of your spouse's, whichever is lowest. "A lot of times if someone has a family and they're paying the premiums on their health plan, they could be easily spending $2,000 on their premiums let alone all their out-of-pocket medical costs," he says. Allan Madan, a chartered professional accountant in Toronto, says the easiest way to determine how much you've paid into health-plan premiums annually is to look at your final pay stub of the year, which should have the total figure tallied up. For those relocating for work, moving and travel costs can really add up. To ease that burden, such expenses are eligible for tax deductions provided your new home is at least 40 kilometres closer to a new job or business. What parents may not realize, however, is that the same tax breaks also apply to full-time students moving to a new home at least 40 kilometres closer to their new school, says Heath. "Moving expenses for children I rarely see claimed," he says. "It could literally be $1,000 to move back and forth." Students who moved to work, including for summer employment or through a co-op placement, can also claim moving expenses provided they meet the previously-stated requirements. While you can use the Canada Revenue Agency's "detailed method" to calculate your travel expenses, that requires keeping receipts and claiming the actual amount you spent, Heath says. An easier approach may be to use the CRA's "simplified method," which allows you to claim a flat rate of up to $51 per day for travel-related meal expenses without receipts. Vehicle expenses are calculated by multiplying the number of kilometres travelled by a cents per kilometre rate, which ranges from 43.5 to 59.0 cents, depending on the province or territory in which your travels began. First-time buyers or those who haven't owned a home in the four previous years can claim $5,000 toward the purchase of a qualifying residence such as a house, condo or mobile home. The tax credit, which was first introduced in the 2009 federal budget, is "meant to help you toward closing costs," says Madan. But, he adds, if you missed claiming this credit in the year of your purchase, you can file an adjustment to a previous tax return provided the qualifying home was acquired after Jan. 27, 2009. The disability tax credit is available for those with a severe and prolonged physical or mental impairment, and covers a wide range of scenarios people may not be aware of. Sometimes it can be a much less obvious disability like diabetes, epilepsy or a learning disability, Heath says, and for those who meet eligibility criteria "it ends up providing an annual tax refund of roughly $2,000, which is a fairly significant sum." For those who've had a disability for a prolonged period of time and have missed out on claiming the credit, tax returns can be reassessed as far back as 10 years. "I had a client who didn't know her son qualified for the disability tax credit," Heath says. "We went back 10 years and she got $20,000 in tax credit refunds." Being eligible for the disability tax credit can also open the door to other federal, provincial or territorial programs such as the registered disability savings plan, the working income tax benefit and the child disability benefit.